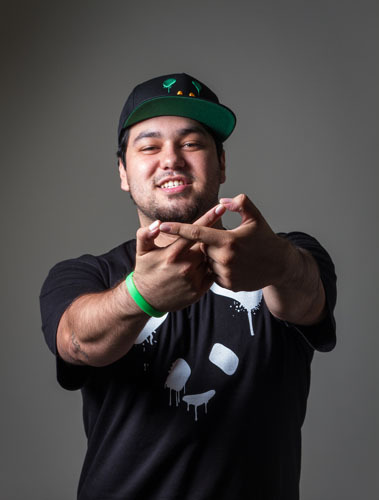 DEORRO (Formerly known as TONIC), a Los Angeles native who grew up in West Covina, is one of the top young upcoming producer/DJs in the music industry. At the age of 14, DEORRO began his DJ career by playing at local gigs and house parties. By the age of 17, DEORRO was already producing his own tracks. A few years later, DEORRO was considered a Soundcloud sensation and sold out international events in Australia twice under the name TONIC. His unique style of fusing Progressive and Electro Dutch music has rapidly spread his tracks across the globe. They have been downloaded over 1 million times. In 2011, DEORRO reached over 20,000 followers & had over 1.5 million plays on Soundcloud. DEORRO has also been on the Top daily charts for Soundcloud numerous times. In late 2011, DEORRO signed one of his most popular tracks, "Big Fat", to BIP Records, which expanded his fan base world wide. One of DEORRO's biggest accomplishments was making the Beatport Top 20 in Electro House. DEORRO has gained support from big names such as Laidback Luke, Tiesto, Kaskade, Porter Robinson, Bingo Players, Knife Party, Afrojack, Chuckie, Sidney Samson, Steve Aoki, Dillon Francis, Alvin Risk, Cazzette, Peace Treaty and many more. In 2012, DEORRO was added as a supporting act on a US Tour, selling out shows in several states and rapidly gaining fans. DEORRO also went on an Australian Tour, and played to sold out shows in Melbourne & Sydney. DEORRO was given the opportunity to close out the main stage at the Good Life Festival 2012 in Melbourne Australia, playing to over 30,000 people, after Skrillex & Steve Angello. It was an outstanding and unforgettable performance, about which people still talk till this day. One thing is certain: DEORRO is a one-of-a-kind act which only comes around once in a generation. His unique sound and style definitely makes him a must-see act. Keep an eye out for this talented individual who will soon make headlines and a huge impact in the EDM industry.